This is an advertisement for Dunn’s Literary Institute. Banking in the 19th century had been conducted on a small and local scale. Banks were established in towns and often had 2 or 3 branches in the local area. The majority of business for these banks was in savings, usually for local businesses. 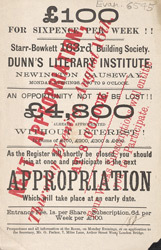 Friendly societies were set up at this time to encourage members to save money and financial schemes like the one featured on this leaflet became more widespread in the 1880s.